The Commodore 64 is a classic, and it has played an especially important role for me. It was the first computer I ever owned; given to me by my parents as a fifth birthday president, and my granda used to spend hours showing me how to program it from a big purple book he had gotten from a magazine. I credit this introduction with piquing my interest in technology early on. Staring at the rainbow loading screen, waiting for games to load from the cassette deck is also probably to blame for my terrible eyesight. I rediscovered the C64 as a teenager when I learned of its coveted SID sound chip, and I’ve been making music with it ever since under the guise of unexpected bowtie. One of the things that always stood out in my mind was the C64’s keyboard, with its thick brown keys and symbols that I never really understood. If I could, I would use it all the time, but that was never really practical. 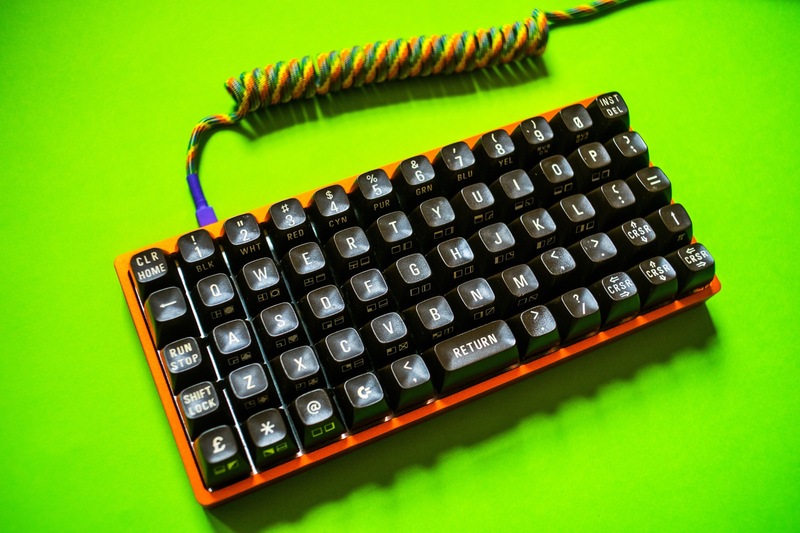 Recently though, I fell down the rabbit hole of ‘mechanical keyboards’ online, where people build and use special keyboards with custom switches, sizes, and layouts. One of the projects I found included a re-working of the C64’s keyboard which brought it into the modern world, and I felt inspired to do something similar. I originally planned to source a broken Commodore online and use the keys from it, rather than defiling my beloved console. Truth be told though, mine was in a bit of a shabby state, and even broken C64s go for a pretty penny in the UK. I decided to just make use of what I had, with the belief that I could always pop the keycaps back on if I changed my mind later. Removing the keys initially proved a bit trickier than I had anticipated… partly because I was trying to get them off while the thing was fully assembled. What you need to do is open up the breadbin itself, and then detach the keyboard from the chassis by taking out some screws. It was pretty easily done once I realised this was what was required – especially since my case had already been taken apart a fair few times to get at the SID. Popping the keys off can be tricky, as they are far stiffer than one would expect from a more modern device. Keycap removers didn’t really work, and so I resorted to using a set of pliers, being careful to pull straight up to avoid damaging the posts underneath. Each key has a large spring underneath which can ping off easily if you move too quickly, so watch out for that. Underneath was filthy, and it seemed like a good opportunity to give things a clean even if I didn’t end up building anything. I left both the spacebar and the Shift Lock keys in place, as I suspected they would be a bit more fiddly to deal with, and I wasn’t planning on using them anyway. Finally, I gave the keycaps a clean with some soapy water and left them to dry. There are lots of mechanical keyboard designs to choose from. 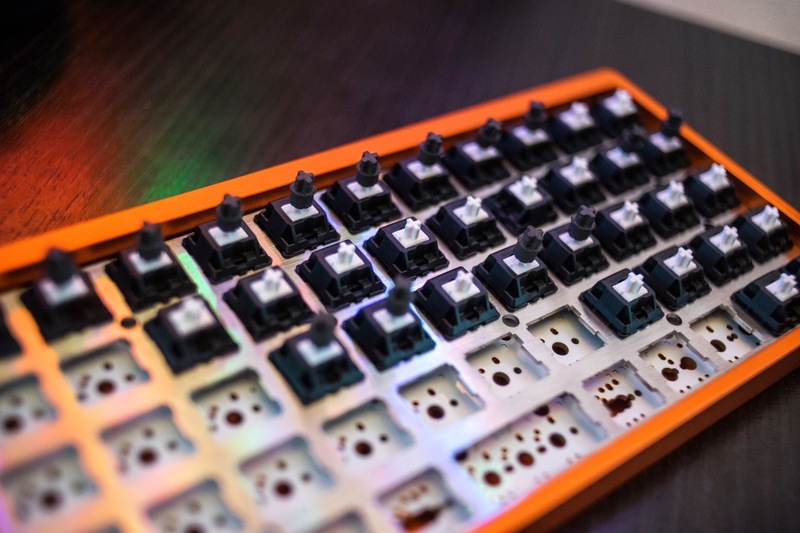 For this project, I went with the Preonic, and got a partially built kit as part of a group buy from Massdrop, which came with a fetching orange aluminium case. 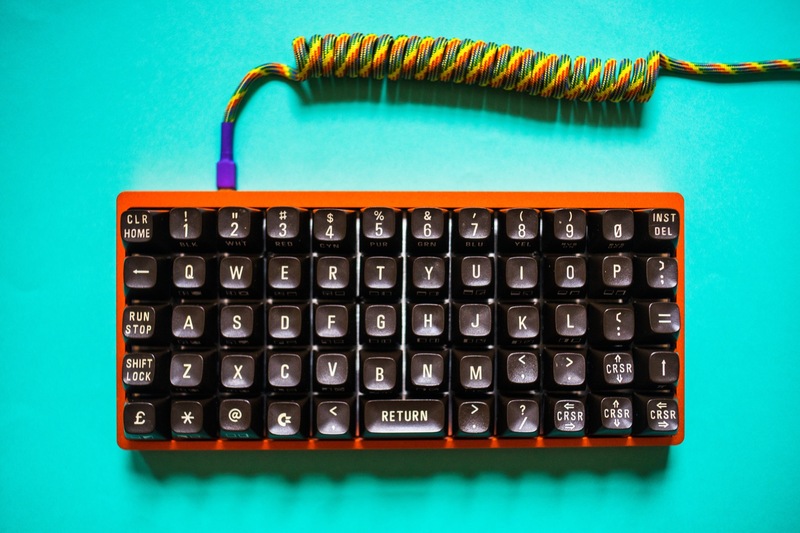 It is a compact, ‘ortho-linear’ keyboard – which means the keys are arranged in a grid like pattern, rather than staggered as you would see more commonly. The idea is that your fingers have to move less, and in a more natural way when typing – which reduces strain. I opted for the Preonic (rather than the Planck, which has less keys), as I wanted to make the most of the C64 keycaps. One of the main reasons people like mechanical keyboards is the quality and range of switches available. The switches are the bits underneath the plastic caps with the letters on them (or not, depending on what you prefer). Unlike the squishy keys you find on laptops and other modern computers that are so unsatisfying to use, mechanical keyboards feel great. They can either be smooth (linear), have a bump (tactile), or have a bump and an audible noise (clicky). 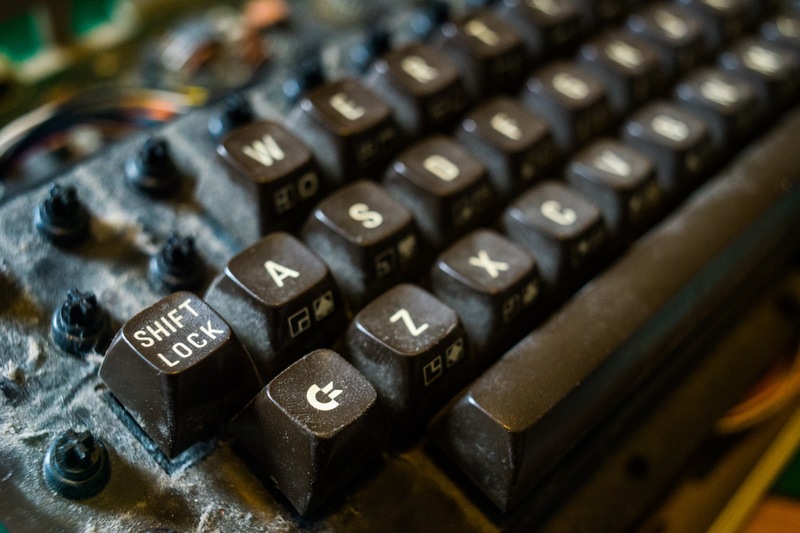 Most people probably mentally associate typing experiences from yester-year with the clicky type – personified by the Cherry MX Blue switch, though the Commodore 64 actually had smooth keys. For this build I opted for the Cherry MX white (aka milky). They are clicky keys, but with a far less sharp and pronounced click than the Cherry MX blues. This means it’s a bit more socially acceptable when typing around other people (!). 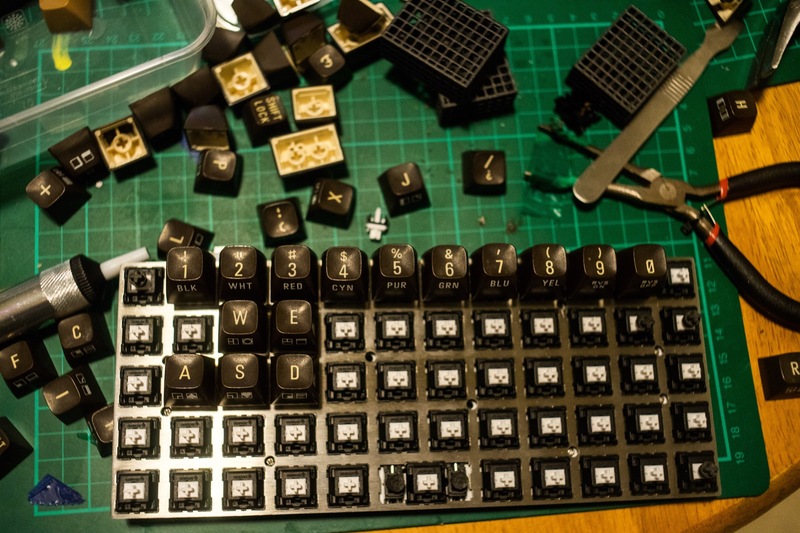 The biggest issue with this project was that the keycaps from the Commodore 64 aren’t compatible with any of the switches that are commonly used today, and so wouldn’t just snap on. 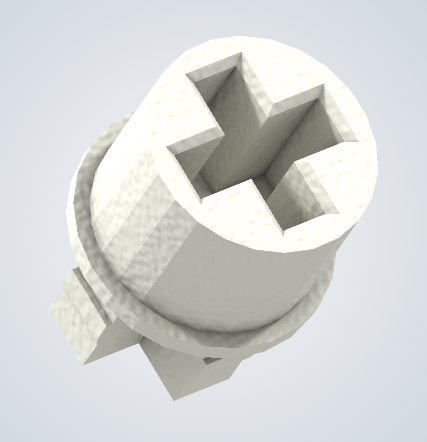 However, some wonderful person has designed a C64 to Cherry MX adaptor that can be 3d printed and shared it for free (open source is wonderful). I don’t have a 3d printer, so obviously had to outsource this. Getting a decent price in the UK was tricky at first, as nobody would take up an order that small, but eventually I got 80 caps for £22.98 including delivery from 3DPrintDirect.co.uk. That would be more than enough to cover the 60 keys on the Preonic. The material was SLS – carbon reinforced plastic. It took about two weeks for the adaptors to arrive. I had read that some people had trouble with their adaptors, especially if the finish on the 3d printing was rough, but mine worked out pretty well. At first I thought I might have to disassemble the switches to install them as they were very tight, but in the end I could just press them against a flat surface and push hard with the keycaps on. My fingers hurt after doing a bunch, so I did them in batches. When the board arrived, I realised that it actually made much more sense to put the adaptors into the caps first, and hit them gently with a small hammer, before pressing the whole thing onto the switch. Getting them at the right angle could be tricky, but they all turned out fine in the end. 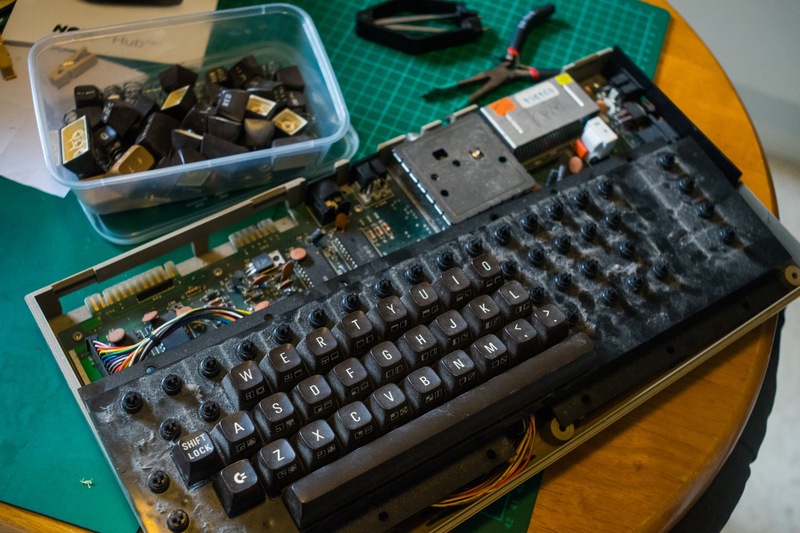 It’s worth noting that I did also discover that removing an adaptor from a keycap isn’t really possible without destroying the soft plastic and leaving the inside of the cap gunked up, so that means that these caps are now committed to the project, and won’t be reusable on the C64 itself like I had hoped. The Preonic kit I got came from Massdrop in a bundle, and it was packed and presented beautifully. The instructions however, weren’t exactly n00b friendly, and it took me a bit to work out exactly where the spacers and screws were meant to go; it seemed like there were extra unnecessary holes in different places, which threw me. Eventually it came together though, and things began to take shape. I’ve done a fair amount of soldering in my time modifying Game Boys etc, so it wasn’t a difficult task to deal with the through-hole switches. I did discover that one of them was bust after putting it all together though, which meant I had to de-solder and replace it, which was a bit of a pain. When I started looking at the actual layout of the board, I ran into a couple of issues with my plan to use the Preonic. Firstly, I had overlooked the fact that the board is built around a grid of single keys, and doesn’t really support anything larger except in the middle of the bottom row. That meant that I didn’t have enough keys from my C64 to cover the full thing, and no perfect option for the space bar. Secondly, my choice was further restricted by the design of the C64’s keys, as the caps are ‘sculpted’ depending on where they sit, so I couldn’t just take one from the top row and put it on the bottom, even if it would work better for my purposes. In the end, I managed to source some extra single keys online, and did the best with what I had. I had feared that it would be wildly off, or that I would need to use really inappropriate keys, but it actually worked out not too bad at all. Some folks have commented that the layout doesn’t make much sense, and I should say that I am not religiously sticking to what is printed on the keycaps. For example, I am using the ‘Return’ key in the place of a space bar, as that was the only key from the original board which seemed appropriate and fit the slot on the PCB. I’m using an equals key for Enter. The @ key brings up a list of my bookmarks with Shiori; The £ key activates my Alfred snippets; RUN STOP is my Hyper Key; < and > activate the ‘Lower’ and ‘Raise’ layers of the Preonic, and so forth. The beauty of the software which powers these keyboards (QMK) is that you can map and re-map the layout to whatever makes sense for your own needs. You can find details of my layout over on GitHub. As a finishing touch, I got a special rainbow coloured USB cable made up from coolcable.co.uk as a nod to Commodore. Special thanks to them who put up my last minute changes to the connectors as I ordered the wrong thing. I still need to set up the Preonic’s layers to suit my own custom layout, but I really like the board. It’s nice, solid and relatively compact, and now I have a personal homage to my granda and first computer. The keys feel pretty great to type on, though they could potentially have done with some heavier switches as the cap and adaptor combo mean that you end up putting more force on the keys than you usually would. Edit: This was featured on Hackaday, which is awesome.